The HTC Droid DNA wins our award for Best Budget Android Smartphone from Verizon with a design that's attractive and comfortable, fast performance and great camera. We've now reached a point of technological advancement that a well-made and powerful phone from last year is plenty good enough for today. This is especially true if you're looking to save some money on the purchase. 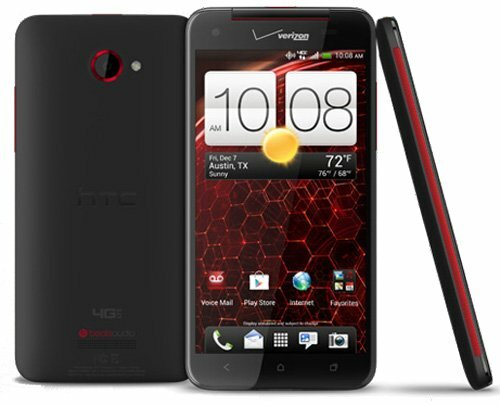 The Droid DNA from HTC is available now for only $50 on contract at Verizon Wireless. This was one of the first phones to prove that a big, 5-inch display didn't have to mean a big, unmanageable phone. Like the Galaxy S4 that came later, the Droid DNA kept things slim and compact around a large screen. Plus, HTC's baby delivered speedy performance and an excellent camera experience. With a price drop from $200 to $50, the DNA is the best budget Android phone on Verizon Wireless. The DNA's durable metal body has curved edges and a grippy, rubberized polycarbonate plastic back that makes it comfortable to hold and hard to drop. Despite the 5-inch display, the phone doesn't feel too big in the hand. One-handed operation will be difficult for people with small hands. Still, that screen is gorgeous: full 1080p HD resolution, 440ppi pixel density, rich colors and wide viewing angles. It's worth the bit of extra bulk on the phone. Overall, the DNA is light for its size. More than most phone makers, HTC pays close attention to audio quality. With Beats Audio on board, you'll get really great sound quality through headphones and better-than-average quality from the speaker in back. Under the hood, the Droid DNA runs on a quad-core processor and 2GB of RAM, meaning you'll experience smooth and speedy performance, and the phone will have no trouble multitasking. The 16GB of internal storage is enough for most apps, but unfortunately that's all you get for photos, music and videos as well. There's no microSD card slot. The DNA runs on Verizon's speedy 4G LTE network and falls back to 3G when out of range — not likely for most people, since this is the most widespread of all the U.S. LTE networks. Other wireless radios: a/b/g/n dual-band Wi-Fi, Bluetooth 4.0, GPS, NFC and mobile hotspot capabilities. You'll be able to make it through a full day on the battery if you use the DNA's power-saving tweaks or hook up to Wi-Fi when possible. Another area where HTC usually delivers a stellar experience is its cameras, and the Droid DNA is no exception. The 8-megapixel camera on the back captures colorful outdoor images and does really well indoors and in mixed or low light. It's helped by the great camera app that includes lots of helpful settings and tweaks to help you take better photos. The 2.1-megapixel front-facing camera also deserves some attention, thanks to the wide-angle lens. It can capture more people in the shot or more of the background, giving more context to your selfies. HTC includes their skin/user interface over Android 4.1. It's one of the most extensive skins next to Samsung's TouchWiz and is far better looking than the competition's. The extra features and enhancements make Android easier to use and customize. Todd Haselton of TechnoBuffalo confessed himself "head over heels" for the Droid DNA. The beautiful 1080p display is "stellar; text is noticeably much crisper ... really bright and easy to read under direct sunlight ... You can see the screen from nearly every angle with ease." Engadget had similar praise, saying that images "appear to just float above the screen. The font rendering is crisper than anything we've ever seen, and 1080p movies look simply stunning." Five inches may be a big device for some, but Engadget's Brad Molen found the phone "much easier to use for one-handed tasks without needing special keyboards or dialpads." "Despite its supersized proportions, we could still use the device comfortably with one hand," LaptopMag concurred. Reviewers couldn't get enough of the DNA's overall look and holdability. "Everything about the phone — straight down to the Ferrari-inspired edges — screams luxury and ensures a comfortable experience," says Engadget. The quad-core processor coupled with Android 4.1 Jelly Bean made for "buttery smooth performance," according to TechnoBuffalo, which also praised the "amazing Google Now support" and voice control capabilities. The rear camera, good though not always great, is capable of producing "overall good quality shots" with "natural colors," says Engadget. All reviewers agree that the wide-angle front camera makes a big difference in video chats. The Galaxy S III is a bit smaller than the DNA, and the size offers a nice balance between a big screen and one-hand usability. The 4.8-inch display is beautiful, and the dual-core performance is speedy enough for most non-game apps. The S III isn't as powerful or future-proof as the DNA. Samsung's additions to Android's features make the operating system easier to use and are far more extensive than HTC's, but that doesn't appeal to everyone. The 8-megapixel camera isn't as good as the Droid's. A small but important advantage on the S III's side: It's such a popular phone you won't have trouble finding accessories and cases for it. Big phones are great but aren't for everyone. If you want a smaller screen, you'll appreciate the trend toward "mini" versions of popular smartphones that sell at a lower price. Unfortunately, these minis are usually less powerful as well. Even so, the 99-cent-on-contract Droid Razr M still holds up well a year later. With this, you get a clean, unaltered version of Android, a few great preloaded apps (SmartActions being a favorite), a bright 4.3-inch display, industrial chic design and pretty good performance. The Razr M's camera could be better, and its 8GB of internal storage is pretty paltry. This phone is good for customers who don't do much in the way of gaming or multimedia. For a well-rounded phone on all fronts, you want the DNA. HTC went big with the Droid DNA and it really pays off: a beautiful display, comfortable design, speedy performance, great audio and an awesome camera. We recommended this phone back when it was full price on Verizon Wireless. Now that it's significantly less, there's no hesitation. If you want the best at this price, the HTC Droid DNA is it.